Getting engaged is one of the biggest decisions of your life. You’ve found the right girl, now you need the right ring. Giving your betrothed to be an offering of a ring can be traced back to ancient Egypt. Egyptians have been found buried wedding rings made of precious metal wire on the ring finger of their left hands. The reasoning behind this is that the ring finger is believed to be connected directly to the heart by the vena amoris. Over time simple silver or gold wire has evolved into a huge and varied array of gold, platinum, silver, and titanium rings and bands. The engagement ring in particular is centered around one or more diamonds which have in themselves become an internationally recognized symbol of love. When it comes to buying a diamond ring don’t fall prey to lavish advertising campaigns. At the end of the day no matter where you shop what matters – is the ring itself. The typical markup in the retail jewelry industry is right around 1,000%. That means that when you are browsing the cases in a retail store, a ring which is priced at $1,999 likely only cost them from $149 to $199. You are paying for overhead, salaries, rent of high end real estate, brand recognition, prestige, and the fluffed up shopping experience. It is an expensive business to be in, and that expense gets passed on to the consumer. Pawn shops don’t care what the retail price of the ring was. We realize that is an artificially constructed number. Some sellers may think they are being low balled on the offer when pawn shops buy, but that simply isn’t the truth. They are normally offering a good amount for what the real value of the ring is based on stone, metal, quality of craftsmanship and design. Because of this, once the ring is thoroughly checked by First Pawn’s in house jeweler, professionally cleaned and in the best condition possible it is placed for sale at a small fraction of the original retail asking price despite often being in the very same condition. Pawn shops offer a huge selection in style of rings from vintage heirloom pieces to recent designer fashions. Each as unique as your love. 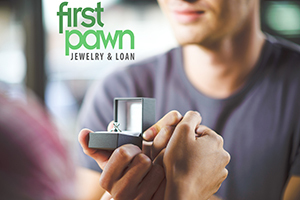 Before you buy an engagement ring retail, come shop First Pawn Jewelry and Loan and check out our selection. Buying an engagement ring at your local pawn shop is the smart choice. Save that extra money for the honeymoon! Looking for and engagement ring!